Art appreciation is universal and theatre is a cultural experience which can enrich one when travelling to a foreign country. Theatre can give insight into a society as well as provide entertainment for all age groups. Many tourists from all over the world flock to theatres in London for the famous West End shows or Beijing for the Chinese opera performances to feast their senses on the cultural experience. Many holidays abroad will not be complete without a trip to the theatre, especially for art lovers. But their enjoyment of the show can be marred when faced with language barriers as not all theatre-goers are multi-lingual or proficient in several languages. A WiFi-enabled hand-held device which can translate a theatre performance in real time on an LED-lit screen will make the show more accessible to visitors from different parts of the world. The speed of the translation will be aligned to stage action and is controlled by the stage prompt. Translations are available in English, French, Italian, Spanish, German, Russian, Japanese, and Chinese. 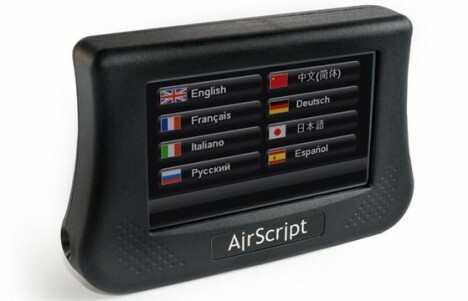 AirScript is developed by Cambridge Consultants and makes use of technology to provide solutions to individuals with varying language needs instead of the traditional side screen which can be rather distracting and offers only one translation. The device will not affect others’ enjoyment of the show and can even be used by the hearing impaired. It has been trialled in the staging of Hairspray in London’s Shaftesbury Theatre.